LOS ANGELES, California – (27thMarch 2019): Cinco de Mayo is right around the corner, but it may as well be called Cinco de Guac, because every gathering worth its salt is guaranteed to have plenty of the delectable green dip to go around. There’s just one problem: an hour into the celebration, that once-irresistible avocado spread debuts a decidedly repellant shade of brown. Save the day with avoFresh™, new from the award-winning team behind best-selling eatCleaner® Triple Action Fruit + Veggie Wash and other innovative, earth-friendly products that make America’s kitchens safer and healthier. This organic powder is uniquely designed to inhibit browning by slowing the oxidation process, keepingthe heart-healthy fruitgorgeous and green for up to 7 days. Clean all produce – including avocado skins, which can carry listeria and other harmful bacteria – with eatCleaner® Triple Action Fruit + Veggie Wash.
Slice 3 medium avocados in half, removing the stone and scooping out flesh with a large spoon into a medium-sized bowl. Mash avocados with the back of the spoon and blend in one packet of avoFresh™ until incorporated. Add 1 small diced jalapeno, 2 tbs fresh cilantro, 2 tbs minced red onion, 2-3 cloves crushed garlic, 1 tsp smoked sea salt, ½ tsp white pepper, and ½ tsp ground cumin. Let rest in the fridge for at least one hour before serving. Made with Vitamin C and Calcium Carbonate, avoFresh™is OMRI-certified for organic use and is naturally vegan, gluten-free and salt-free. Enjoy that tantalizing just-cut freshness for up to one week! Available in a 3-pack for just $4.99 on Amazon.com and at EatCleaner.com. Also available in 100-pack cases for food service and institutional use. 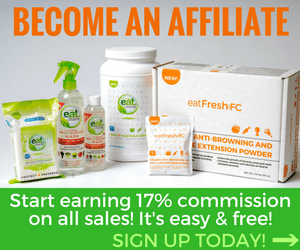 Visit EatCleaner.com to learn more. Grow Green Industries, Inc. dba eatCleaner® is a Southern California based, Certified Woman-Owned Business leading the way in eco solutions for produce food safety and shelf life extension. Co-founded in 2010 by Dr. Shawki Ibrahim, Ph.D. and nationally recognized food safety and clean eating expert, award-winning entrepreneur, chef, author and inventor, Mareya Ibrahim, aka The Fit Foodie, the company is dedicated to providing safe, effective wholesale and consumer products that enhance lives and improve health. Featured on HSN, QVC and reputable retail locations, their award-winning, patented solutions include the best-selling eatCleaner® fruit + vegetable wash and wipes, eatFresh-FCTM anti-browning powder and avoFresh™, and are used in schools, homes, juice bars and food-service businesses. Visit growgreenindustries.com and eatcleaner.com to learn more.